Xanthosoma Albo Marginata (Micky Mouse) is thought to be a mutation of a species. Most think it is a form of atrovirens or even a possible hybrid. 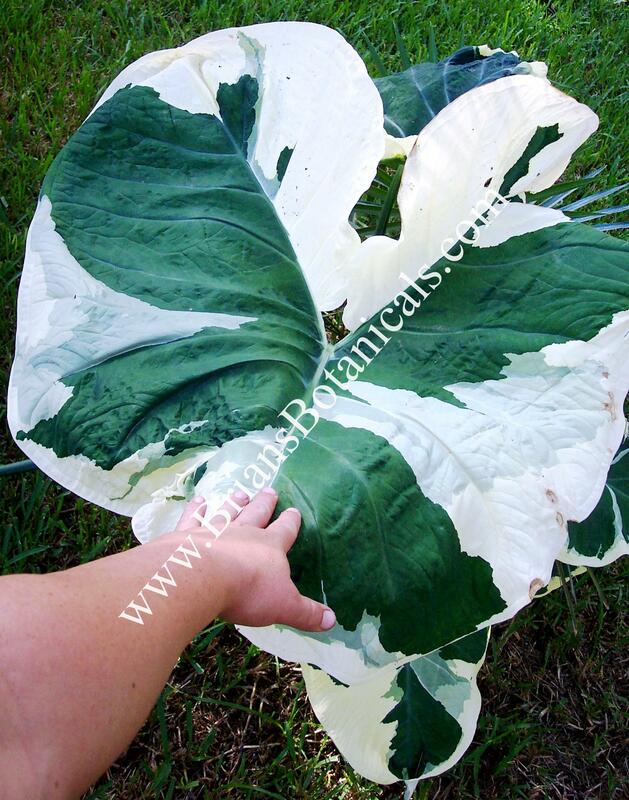 The leaves are never identical most are streaked with large blotches of white on dark blue green leaves. One of the most odd features of the plant is the fact that most leaves will develop a small cup like pocket at the leaf tip and sometimes a small string like structure will form. Plants usually grow 3 to 5 feet tall with leaves held horizontally. It is always a conversation piece in the garden. I have never seen the plant flower but the foliage alone is intriguing enough. Plants produce tubers and should be wintered in either in a hot house or cool storage. Plants sold are in 4 1/2 inch pots.